I have had another go at shooting 47 Tucanae, now that I have a better idea of exposure settings, etc. The following images are shot on my ZWO ASI120MC camera mounted on my 130 mm aperture Newtonian (650 mm focal length), with Sensor Gain set to 50%, to avoid "overloading" the sensor, with exposures of 5, 10, 20 and 30 seconds respectively. They're not perfect, but I'm pretty happy with how it's coming along! My focus is much better this time, and you can see a little bit of colour too. 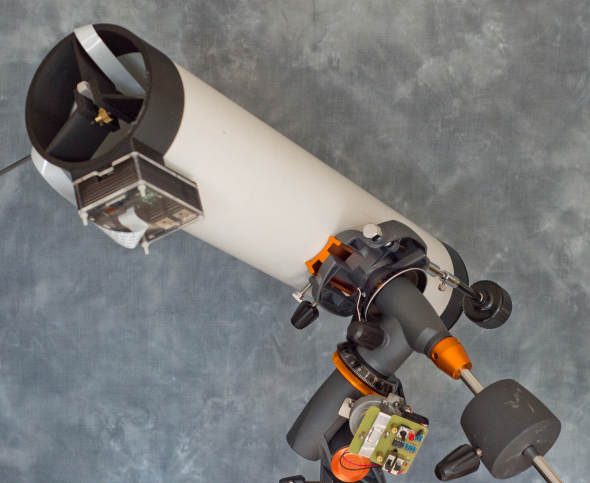 Now THIS is convergence: The PiKon - 3D Printing an astronomical telescope using a Raspberry Pi camera sensor! All of my hobbies rolled up in to one - how cool is that?! So, having had a bit of a play with some night-time all-sky imaging and daytime terrestrial targets, I finally had some reasonably clear skies last night (well, barely reasonable - it was hazy, with about 50% cloud cover), but I thought I'd see what my ZWO ASI120MC camera http://julianh72.blogspot.com.au/2014/09/zwo-asi120mc-planetary-camera-quick.html can do. By the time I got set up, there weren't any planets in the sky visible from my garden, and the Moon hadn't risen, so even though this is mainly a planetary camera, I thought I'd see what it could do with an easy DSO target. I set up and aligned the telescope, pointed it at the brightest star in the southern sky, took out the eyepiece adapter, and screwed on the camera, and wound the focuser to roughly the position where I knew focus could be found. Then I plugged the camera into my Toshiba Encore Windows 8.1 tablet, started FireCapture http://firecapture.wonderplanets.de/ , and was gob-smacked to see a slightly out-of-focus star image straight away. Wow! Surely it can't be that easy?! I focused to get the sharpest image I could, and fired a few frames - Yep! I was clearly getting recognisable star shots, including a few background stars I hadn't noticed by eye. 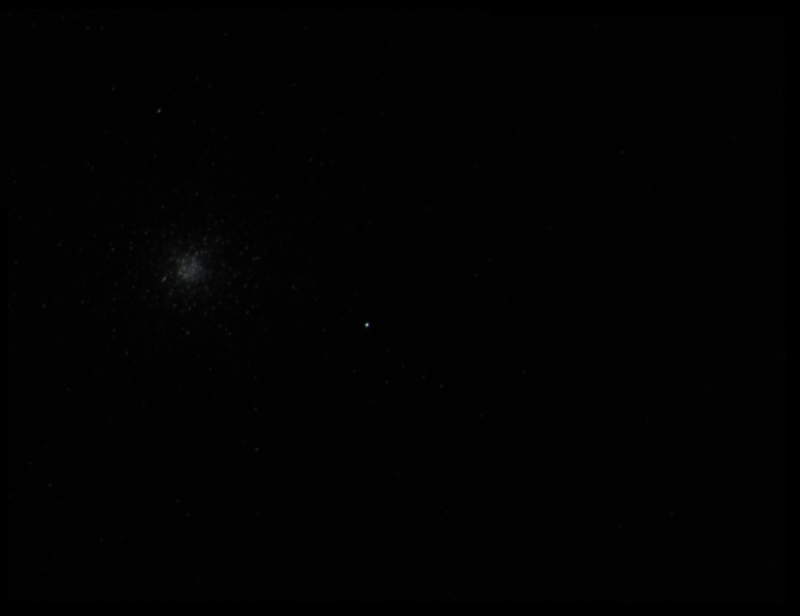 I then slewed the telescoped to an old favourite - the 47 Tucanae http://en.wikipedia.org/wiki/47_Tucanae globular cluster. I had to manually adjust the telescope alignment a bit to get it centred, but once it was in frame, the SLT's tracking kept it nicely on the sensor. I then fired off a few short videos and BMP series using FireCapture, experimenting with different exposure settings. For each series of shots with new settings, I tried resetting FireCapture's automatic Dark Frame function and taking a new dark frame, to compensate for the changed exposure, gain, sensor temperature, etc. I then retired indoors to have a look at what I had caught, and what I could extract with stacking frames using AutoStakkert http://www.autostakkert.com/ etc. Again, I have a lot to learn, but there's no mistaking it - that's 47 Tuc alright! The image is straight off the camera, with the same Field of View as the previous AVI - no retouching or post-processing. At first I was puzzled as to why the BMP seems to be zoomed in so much compared to the AVI and stack, but the more I think about it, I think it's really that the 60 second exposure captures so many more faint stars than a series of 1-second exposures (well, DUH! ), so they're showing pretty much the same Field of View, but the AVI only captures the "hot core" of the cluster, while the 60-second frame captures much more of the full structure. I'll try again soon with a series of intermediate exposures - say 10-second, 20-, 30- and so on, and I'll expect to see the cluster "grow" as the exposure time increases. These shots were all focused by eye on my little 8" tablet screen; next time out, I will try for better focus using my Bahtinov Focussing Mask http://en.wikipedia.org/wiki/Bahtinov_mask . But overall - I'm pretty happy for my first effort! I've been looking around for an affordable telescope camera that can do some basic Deep Sky imaging, as well as the usual lunar and planetary work. I also have a Future Optics 3 Mp TVV3000 digital telescope camera: http://www.future-optics.com/product/html/76.html This works fine for its intended use (terrestrial and planetary imaging), but it only has "typical" webcam sensitivity, and has no long exposure capability, so DSO work is pretty much ruled out. The ZWO range of CMOS telescope cameras has been getting some pretty good reviews recently, and the price seems almost too good to be true. These cameras use the cheaper CMOS "webcam" sensor technology as seen in planetary cameras, rather than the more expensive CCD sensors usually seen on Deep Sky cameras, which explains their lower price, but they have the sensitivity and long time exposure capability to also be used for basic deep sky work. A really nice feature is the solid anodised aluminium body (red for this model - MUCH nicer than the standard plastic body you normally get with a low price camera! ), which is 2" outside diameter (to fit straight into a 2" focuser), with a standard M42 T2 thread on the inside to screw onto common camera adapters. And of course, it also has a 1 1/2" eyepiece adapter - you shouldn't have any trouble fitting this to your optical train! 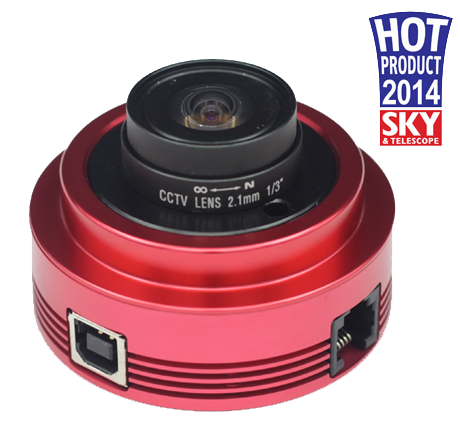 Something which really sets it apart from the competition is that it also ships with a 150° super-wide-angle lens for doing "all-sky" imaging, without using your telescope - brilliant for capturing meteors or satellite fly-overs! The wide-angle lens screws into an adapter which fits into the T2 thread, so I imagine you could fit other CCTV camera lenses if you want. The back of the camera body has a standard camera thread, so you can mount the camera straight onto a tripod for use with a lens fitted - a nice touch! And one more thing (as Steve Jobs used to say) - it also has a built-in auto-guider port, so it can also be used for auto-guiding as well as imaging. The asking price is US$279 (+ US$20 for express delivery) - I don't know of any other camera that comes close in performance and features for that sort of money. I ordered it direct from the Chinese factory last Saturday, and received it in Brisbane Australia yesterday (Friday) - 6 days from order to delivery, a really excellent delivery service! I unpacked it, plugged it in, and turned it on - and it worked perfectly, straight out of the box! (The wide angle lens comes pre-installed, so the first thing I saw was myself, and the ceiling of the room where I was sitting.) I have tried it on two computers - an older Dell Windows 7 laptop, and a new Toshiba Encore 8" Windows 8 tablet - and it works perfectly with both. The supplied software is excellent - the Windows drivers installed without incident, and the recommended FireCapture imaging software http://firecapture.wonderplanets.de and AutoStakkert stacking software http://www.autostakkert.com/wp/ are both powerful and easy to use. (I've used RegiStax http://www.astronomie.be/registax/ previously, but AutoStakkert seems to me to be much simpler and more intuitive, and gives excellent results with this camera.) The camera seems to be recognised as a standard Windows device, so it will probably work with any other software of your choice, but I'll stick with FireCapture and AutoStakkert for now. After a bit of playing indoors to check out the functionality and the software, I took it outside, and was immediately getting better video and images than I have managed to date with my other equipment. For my first night-time capture, I set up the camera with the wide angle lens looking straight up from a tripod, and got some all-day videos. While I still have to learn a bit about optimal exposure settings, I'm pretty pleased with the results I was getting within 5 minutes of taking it outside! I then attached it to my 90 mm Mak http://julianh72.blogspot.com.au/2014/08/review-twinstar-90-mm-1200-mm-f133.html, and grabbed a few quick star shots - nothing to compare with the Hubble Space Telescope, but still very gratifying to me, and much better than anything I've managed before. It's not often that things work so easily, and so well. This camera is a superb product, and unbelievable value for the selling price. It really does do everything that is claimed. Wow! This is ground-breaking stuff! It's like discovering that the laws of thermodynamics no longer apply, or that E is NOT equal to mc^2! In a world-first for mobile technology, Apple engineers have managed to package a screen larger than 4" into a handheld device which promises reasonable battery life, without sacrificing features or performance. All very clever you say - but what's the point? After all, as so clearly stated on numerous occasions by Apple's marketing gurus, it's a well known fact that the human hand could not manage to hold or operate such a behemoth, and the human eye cannot take in so much visual information when presented at a normal hand-held viewing distance. Well, Apple's ergonomists believe that 21st Century humans have evolved new traits in response to our immersive information- rich environment that may enable a select few to deal with such a device. But surely there would be no point in actually manufacturing and marketing a niche device with such limited appeal? Well, Apple has decided to give it a shot, with a new product called the iPhone 6 - and let's face it, if anyone is going to take such giant strides into the unknown, it can only be a company with the huge financial resources and reputation for innovation such as Apple - no other company would have the technical prowess or financial resources for such a brave move. IT watchers wait with bated breath to see if this bold move will make or break Apple.